Kings defenseman Slava Voynov has been suspended by the NHL from taking part in team activities since his domestic-violence arrest on Oct. 19. (He was charged with a felony count of "corporal injury to spouse with great bodily injury" one month later.) Today, Voynov practiced with the Kings. That wasn't part of the deal. GM Dean Lombardi said he thought it'd be good for Voynov to be around his teammates again. Coach Darryl Sutter said he thought Voynov's participation was fine, because it was an optional skate. Ehhhhh. In an email to the Orange County Register last month, Bill Daly clarified the terms of Voynov's suspension. Skating with a coach was fine. With teammates, under any circumstances, no matter how option? Nope. In an email to the Register, NHL deputy commissioner Bill Daly said the workout "is permissible under the terms of the suspension. He is prohibited only from participating in team activities (practices and other mandatory or optional team functions)." So, a $100,000 fine, announced by the NHL just hours after word—and photographs—of Voynov's participation emerged. 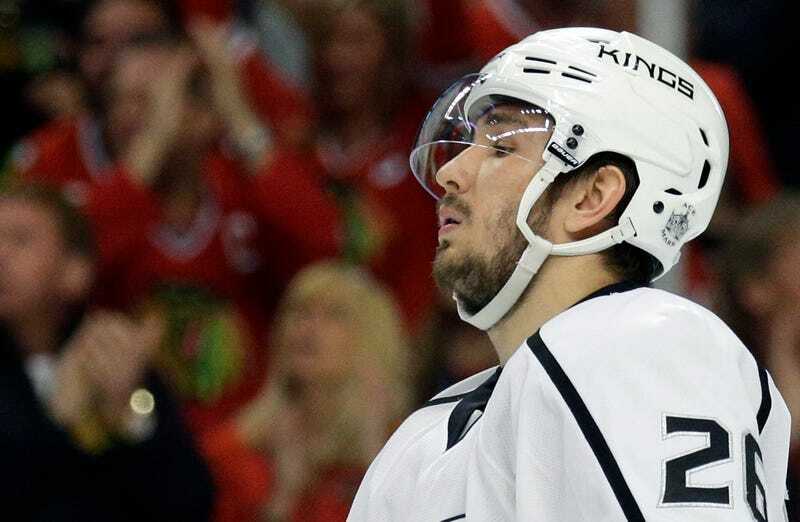 (Some Kings fans are mad at the reporters who wrote about Voynov being on the ice.) A hundred grand is a pretty big number. The league is probably extra-salty because it recently agreed to a deal that would free up Voynov's salary cap hit of more than $4 million.